World War I will be remembered as one of the bloodiest wars in human history. Millions of soldiers died on both sides, and whole generations of young men were wiped out. Armies were bogged down in impenetrable trenches, resulting in thousands dying in futile assaults against fortified enemies. The war also introduced new and terrible weapons, such as the machine gun, which made the war even more horrific and bloody. There are many terrible battles, but this is a list of the worst. Following the failed Russian invasion of East Prussia, the Russians managed to inflict a defeat on the Germans at Gumbinnen and make a push toward the West. The Germans quickly moved to consolidate the German Eight Army to halt the Russian advance. 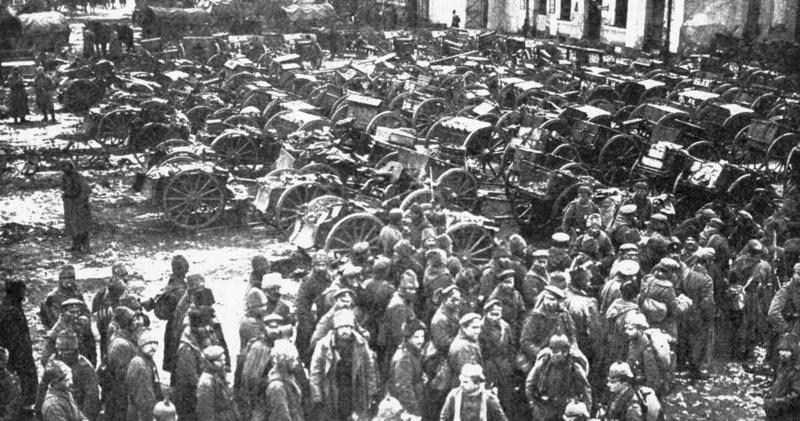 Despite being outnumbered, the Germans, outnumbered by two Russian field armies, managed to inflict a huge defeat on the Russians at Tannenberg, considered by some to be the most lopsided defeat in the war. The Russians suffered 170,000 casualties to the Germans 12,000, highlighted the ineptitude of the Russian commanders and the ineffectiveness of the Russian army. By 1917, the Western Front had been at a stalemate for two years. Many bloody battles, including the slaughterhouses at Verdun and the Somme, had resulted on millions of casualties on both sides, and Europe was growing weary of the war. The Allied high command needed to break the German lines and advance. The German army was by now numerically inferior, and a solid victory breaking the German lines could easily end the war. As a result, a plan was formed to assault the German trenches at the town of Arras, which, combined with a French assault to the South, was hoped would finally break the deadlock on the Western Front and bring about an Allied victory. The Battle of Arras opened on 9 April, 1917, and initial efforts led to the capture of the strategically important Vimy Ridge by Canadian forces and to major gains by British forces in the center. However, when the battle closed on 16 May, 1917, the British advance had been halted. Although tactically a British victory, the battle did not result in the hoped for breakthrough, and was ultimately indecisive. The British lost 158,000 casualties in the assault, to a German loss of 120,000. By 1915, the war in the West had bogged down. Both sides had constructed massive trench networks and were losing men in futile assaults against the fortified positions. Additionally, the shocking defeat at Tannenberg had put Russia’s back to the wall, risking the Allies losing a valuable contributor to the war effort. With the casualties mounting, the Allies decided on a gamble; open up a second front. Sir Winston Churchill, then First Lord of the Admiralty, decided on an attack on the Dardanelles in modern-day Turkey to threaten the Ottoman capital of Constantinople. The allies hoped the second front would help break the deadlock on the Western Front, and bring relief to the beleaguered Russians by opening up a sea route for resupply. When initial naval attacks failed, the Allies decided on an amphibious assault to crush the Ottoman army. The allies believed that the Turks would simply fold up and collapse with minimal casualties (the Ottoman Empire was called the “sick man of Europe” in that time and was viewed as being weak. However, the exact opposite happened. The Turkish troops dug in and resisted, stymieing the Allied landings. The result of this, along with poor planning on the part of Allied commanders, was the Allied troops were bogged down on the beaches and failed to achieve their objectives, and the Gallipoli front eventually bogged down into the same trench warfare as seen on the Western Front as British, Australian and New Zealand forces clashed with the Turks, trying to break out of their beachheads. The allies ended up losing 220,000 men to the Turks 253,000, and the Ottoman Empire earned a stunning victory. Side Note: The Gallipoli campaign is said to be the time when Australians and New Zealanders started to see themselves as a separate and unique country from Britain, coming from stories of the bravery of the Australia and New Zealand Army Corps (ANZAC). In early September of 1914, the German army had overrun Belgium and was pushing through France, threatening Paris. British and French forces had already taken heavy casualties trying to stop the Germans, and it seemed that Paris would fall to the German forces. Desperate to stop the German advance, British and French forces consolidated on the Marnes river, just outside Paris. The Allies were finally able to halt the German push into France in a counterattack against the Germans by six French field armies and one British army, causing heavy casualties to the German army and forcing them to abandon the Schliffen plan and retreat, in a event that came to be known as the “Miracle on the Marnes”. Despite the Allied victory, the battle was a costly one; the Allied forces suffered 263,000 casualties, and the Germans 220,000. Also, the battle forced the Germans to retreat and then consolidated and begin building fortifications, causing the Allies to respond and leading to the bloody trench warfare that would characterize the Western Front. Just about every schoolchild knows that World War I started when the Archduke Franz Ferdinand, heir to the throne of Austria-Hungary, was assassinated by Serbian nationalist Gavrilo Princep. They also know that shortly thereafter, Austria-Hungary invaded Serbia, causing the Russians to declare war on Austria-Hungary, and then the Germans to declare War on Russia, and then so on and so forth. The Serbian Campaign opened with the Austrian shelling of Belgrade on July 29, 1914, followed by the military invasion of Serbia on August 12. Despite being outnumbered, the Serbians managed to blunt the Austrian invasion for most of 1914 and into 1915, when the Germans and Bulgarians joined the Austrians in the effort to conquer Serbia and launched a new offensive, culminated in the Battle of Kosovo in November and December of 1915, where the Serbian army was finally broken and Serbia crushed. The campaign was horrendously bloody for both sides, with the Austrians, Germans and Bulgarians losing a combined 313,500 casualties, and the Serbians losing over 320,000. This battle, fought from July to November of 1917, has come to be synonymous with the grinding and bloody misery of trench warfare during World War I. Also known as the Third Battle of Ypres, the aim of the battle was to breakthrough at the village of Passchendaele in West Flanders, Belgium and outflank and beat back the German Army. In a series of “bite and hold” operations against the German lines, the Allies sought to wear down the Germans through bloody attrition warfare, culminating in the Canadian Corps taking control of Passchendaele on November 6, 1917, ending the battle. The conditions during the battle were miserable; both sides suffered horrific casualties, with the British gaining only slender territorial gains for their efforts. Mud was a constant feature of the shot up landscape, bogging down tanks and even drowning men. The British Prime Minister of the time, David Lloyd George, used the battle as an example of senseless waste and bad generalship. The Allies lost a total of 448,614 men to the Germans 400,000. As the battle of the Somme was being planned, the Germans staged a massive attack against the French fortress near the town of Verdun-sur-Meuse. Though the German goal was to capture the town, a much simpler one was even more apparent; simply kill so many French soldiers that it would break the French morale and force them to abandon the fight. The French, though, stubbornly defended Verdun and inflicted horrific casualties on the Germans, while suffering horrific casualties of their own in return. Nearly 40 million artillery shells were exchanged during the battle, pock marking the area with craters, some of which are still visible to this day, and popularized the French battle cry “They shall not pass!”. Verdun came to be for the French and Germans what the Somme was to the British; a symbol of the horrors of war in general, and of the futility of World War I in general. The French lost some 542,000 casualties, while the Germans lost some 435,000. One of the two great slaughterhouse battles of World War I, the Somme still rings in the minds of the British as an example of the senseless slaughters of the war. Planned in 1916, the goal of the battle was to be a massive Anglo-French effort to create a rupture in the German lines that could be exploited with a decisive blow. The German attack on Verdun, however, forced the Allied commanders to change their plans, and the battle became a primarily British offensive, though the French still contributed significantly. The British prepared for the offensive with a massive several day artillery barrage on the German lines, which they hoped would damage the German defenses enough to allow British forces to break through. On the opening day of the battle, they learned that it in fact failed to do so when the British suffered 60,000 casualties in one day; the greatest single day loss of life in the history of the British Army. Attacks continued all along the Somme area until 13 November, 1916 when the offensive finally petered out. The battle, though ultimately indecisive as there was no breakthrough, was strategically important to the allies, as it forced the Germans to withdraw 40 miles and later set the stage for the final Allied victory in 1918. The Allies paid for it dearly, however; the Allies lost a total of 623,906 casualties, including 100 tanks and 782 aircraft. The Germans lost nearly 600,000 men. Also known as the Ludendorff Offensive or the kaiserschlacht (Kaiser’s battle), the Spring Offensive was launched, as its name suggests, in the Spring of 1918. Germany’s back was against the wall; the country was suffering from a British blockade of its ports, and it had lost so many men that the German army was having to recruit old men and young boys to fight at the front lines. In addition, the arrival of thousands of fresh troops from the United States was paving the way for a certain Allied victory. The German high command knew the only way to win the war was to defeat the Allies with a major offensive before the Americans could be fully deployed. German general Erich Ludendorff was chosen to plan the offensive, which was launched on 21 May, 1918. The plan was for a major push against the Somme front held by the British, with three other attacks intended to divert Allied attention from the main push. It was hoped the attack against the Somme would break the Allied lines, breaking the British army and forcing the Allies to seek armistice terms. Using fast moving “stormtroopers”, the Germans initially made significant advances, pushing the Allies back and gaining a huge chunk of land in World War I terms. However, the operation lacked clear goals, and the Germans ended up moving so fast that they were unable to transport enough supplies to maintain the advance. Also, they failed to provide fast moving units, such as cavalry, to exploit their gains. The Allies eventually dug in and halted the German advance, ending the offensive with the Germans in a weak position to defend when the final push of the war was made. The Germans lost over 680,000+ casualties in the push, mostly to the stormtrooper units leading the assaults, while the Allies lost a combined 850,000+. The attack failed in its goal to break the Allied forces, and combined with fresh American troops, the Allies were ready to make the final assault against the Germans. Side Note: One of the most famous battles in American military history occurred during the Spring Offensive. A force of US Marines and infantry engaged the Germans in the Battle of Belleau Wood, stopping a German advance and contributing to the overall defeat of the Spring Offensive. During the battle, it is said that the Marines fought so fiercely that the Germans began to call them “Teufel Hunden”, which translated into English reveals one of the Marines more famous nicknames; “Devil Dogs”. With the failure of the Spring Offensive, the Germans were left in a weak position, having gained ground that they could not adequately defend and having spent most of their best troops trying to break the Allied lines. The Allies, on the other hand, were battered but not broken, and had the advantage of thousands of fresh troops from the United States, under the command of General John “Blackjack” Pershing. The Allied supreme commander at the time, Marshal Ferdinand Foch, decided that the Allies should go back on the offensive, and agreed to a plan proposed by British commander Sir Douglas Haig to attack the weakened German Second Army at Amiens. The attack, known as the Battle of Amiens, was a success, forcing the Germans to eventually abandon the lines at Amiens. The Allies launched another series of offensives, including the battles of Second Somme, Second Noyons and Second Arras. The result was a spectacular success; the German lines were eventually broken and the Germans were forced to retreat back to the Hindenburg Line, a series of defensive works protecting the German homeland. The Allies then started attacking the Line with a series of offensives directed at achieving final breakthrough. The weakened, exhausted Germans put up a fight, but were unable to defend the lines, and eventually, the Allies broke through the Hindenburg Line at the Battle of Cambrai. The Germans eventually sued for peace, and an armistice was signed on November 11, 1918, bringing the bloody battles of World War I to an end. The Hundred Days offensive was a spectacular success for the Allies, but they paid for it dearly; the Allies lost a total of 1,069,636 casualties, including 127,000 Americans. The Germans lost 785,733 casualties, but perhaps the greatest loss was the collapse of the German Empire and the crushing peace terms the Germans were later forced to accept. Side Note: The battles of the Hundred Days Offensive includes the Meuse-Argonne Offensive, which is the first major offensive of World War I to include American forces in a significant capacity. Great List. Everyone knows we felt the effects of this war only 20 years later but on a closer look we still are, and may always. I don’t like it that the list is called ‘Bloodiest Battles’ because the majority of these statistics include MIA, POW, and injuries along with those men killed in action. Granted this list is in a relatively good order, but some of these battles lasted weeks, and some lasted months – obviously making the casualty list much higher. I’d just like to point out that the first image (for Tannenberg) is obviously from the 18th-early 19th century, not WWI. Some of the troops look to be French Napoleonic soldiers, possibly Borodino or Austerlitz. Sorry to nitpick. Looking at your No 9 entry, my Great-Uncle David Robertson (S/9365, L/Cpl, B Coy, 8th Batt Black Watch, 9th Scottish Division) was killed on 3rd May 1917, during the 3rd Battle of the Scarpe phase of the Battle of Arras. The dawn assault, intended to capture German positions on Greenland Hill, Roeux, was moved at short notice by one hour to 3.45am, while it was still pitch black. There was no time to set out white marker tapes and the attack went in blind. The Germans expected an attack sometime that morning and when the British attacked, our troops stumbled in the darkness, losing direction and cohesion. They were mown down by German shellfire and machine-guns in unexpected advance foxhole positions missed by the British artillery. A complete disaster which went into the painful learning curve for later. If I may offer just a couple of adjustments on your excellent, if saddening list:- No 7 should be the Marne – no “s” on the end and No 4 Battle of Verdun – the photo you have shown is of British soldiers, taken from film footage of the British attack on the first day of the Battle of the Somme – 1st July 1916. Millions upon millions of young men sacrificed for what and by who? Against tyranny and evil… what would you fight for? Where is the Brusilov offensive? There was roughly 1.5 casualties. Are thease battles even real? What about The Battles of the Isonzo? It’s one of the bloodiest with around 1.2 million casualties (Italians actually suffered half of their casualites in the entire war) … not on your list. This was very interesting!!!!!! Help Me Alot In My Project!!!!!! I’d love to know how one of the most pivotal – and bloody – campaigns was left out. The Brusilov Offensive, from my research, had about 1.4-1.8 million casualties, yet it isn’t even mentioned. Interestingly, the battle of the Meuse-Argonne, which is the only large scale battle of the First World War in which the U.S. took part, is the bloodiest battle in the history of the American armed forces. I say ‘interesting’ because for most Americans, WWI is just a barely noteworthy preface to our glorious deeds in WW2 – and yet it was during the First World War, not the second…nor our Civil War…that we fought the bloodiest battle in our history. I find the First World War far more interesting than the Second. This isn’t the 10 most bloodiest american battles. And those who refuse to go to war are called cowards. Why would anyone want to join in this kind of madness,in this day and age, is beyond me. Because they still believe they are “defending their country” when in reality the are “protecting the profits for bankers”. My paternal Grandfather was in 3, 5 and 8. 9th Btn, Sherwood Foresters. So my existence is improbable. what should i do for my project this year, The Battle of Somme or The Battle of Gallipoli. More historical accuracy about the 100 Days Offensive is required. The plan was never ‘proposed’ by Haig — it was in fact a comprehensive plan designed by LTGEN Sir John Monash of the Australian Corps. The ‘rehearsal’ for this Combined Ops offensive was the Battle of Hamel, where Monash planned an attack on the GER positions in a 90 minutes operation. “The battle of Hamel of 4 July—’all over in ninety-three minutes…the perfection of teamwork’, Monash wrote—proved his point. The Americans participated, and Monash had to withstand, by extraordinary force of personality, a last-minute attempt by General Pershing to withdraw them. Military historians have acclaimed it as ‘the first modern battle’, ‘the perfect battle’. ‘A war-winning combination had been found: a corps commander of genius, the Australian infantry, the Tank Corps, the Royal Artillery and the RAF”. The entire OP took him 93 minutes and this was the precursor to Battle of Amiens. You forgot the Brusilov offensive Estimated 2.4-2.8 million casualties. I mention that because you have classified the Emperor Battle” of Sprjng 1918 and the 100 Days as single battles on your list. IIRC, the Carpathian winter war of 1914-15 would slot in at about #6 on your list (actually #7 as everyone gets bumped down a notch by Brusilov) with 800,000 casualties not counting the late fall battles at places like Gorlice, Tarnow and Przesmsyl. The Austro-Hungarian army in that region came out of the winter with some units having lost 75% of their troops, many of those casualties from frostbite, expose and disease. LOL Where is battle of Galicia? The greatest casualties of WW1 is us, all 7 billion humans suffering from central planners who had no hope of being in power before WW1. Before WW1 90% of all government spending was done at the municipal level. My grandfather fought at the Somme when he was 17! Most 17 year olds to day can’t string two sentences together! What about the 12 Isonzo River battles?? Combined they had over 1.5 million casualties.